Ron Paul probably did not have the popular support necessary to make him the official Republican candidate for President. He did, however, undoubtedly have the support necessary to be nominated. Our democratic principles demand a democratic process. They demand that every voice that speaks up be acknowledged and counted. Ron Paul deserved his shot at candidacy even if it was a futile one. More importantly, the American people deserve it: it is their due that all choices be given their due chance to be heard. Instead, the RNC, by deciding on the outcome beforehand and then changing the rules on the spot in order to ignore the opposition, has decided that it has the right to decide which choices we are allowed to pick from: if you don’t like Obama then you have to choose Romney; if you don’t like either, too bad. In effect, the GOP party leaders has made our choices for us. In short, the GOP has abandoned all principle and instead has opted to operate solely on the tactics of political expedience and winning at all costs – including at the cost of their moral character and our liberty. I cannot in good conscience support any party that throws out principle so as to have a better chance of winning. That does not even represent the lesser of two evils: its just evil. This is the state of our democracy; this is our inheritance. Our political establishment has lost its way. Its now up to those outside of the establishment to fight for the cause of liberty and virtue: the weak, the disenfranchised and, most especially, the young. Experts told Politic365.com that Paul’s claim that minorities are disproportionally affected by the “war on drugs” is basically correct. Additionally, McCurdy explained that in the federal system 51 percent of the people that are in federal prison today are in federal prison for drug charges and 40 percent of those are people of color. “And often what happens is, African Americans are assumed to be drug dealers and whites are assumed to be drug users, and therefore whites often get drug treatment where Africans Americans get incarceration,” she said. Statistics compiled by Law Enforcement Against Prohibition from the Department of Health and Human Services, the FBI, and U.S. Census Bureau show in 2010, African-Americans comprised 14.3 percent of drug users in the United States, but were 31.8 percent of those arrested for drug law violations. “Another way to state the data is that black drug users are more than twice as likely to be arrested as white drug users,” said LEAP media director Tom Angell in an email. Some experts like economist Walter Williams assert that the war on drugs is the only major reason that racism is still even an issue today in the United States. The evidence certainly supports his claim. NOTE: These are individual donors, and don’t include super-PACS. When you make a political donation, you have to state what company you work for, and that is how this is compiled. These are not the companies themselves donating, but the individuals who work for those companies. For example, in 2008, people who work for Goldman Sachs, gave over $1 Million to Obama, and were his top donor. In 2012, Mitt Romney’s top donor, is, you guessed it, people who work for Goldman Sachs, at $575,000 and counting. Also the lists provided are the top 20 donors for each candidate. $1,008,000, or 31%, has come from big lobbying firms. Of course, these lobbyists, have the usual list of clients, you might expect, from all the “Bigs”. This is extraordinary: Almost 1/3 of all the personal donations to Obama in this top 20 block, have come from lobbyists and their firms. Remember his 2008 campaign about promising to end special interests? Fully $3,760,000 of that, or 80%…has come from Wall Street firms. Of those top 20 firms whose employees have donated so far $4.72 Million, to Romney, those same firms received, in the 2008 bailouts stolen from the American taxpayer (which of course both Romney and Obama supported), an estimated $335 Billion dollars in bailout money! Infused with $335 Billion of cash taken from the backs of taxpayers?? No wonder they are able to ‘afford’ to donate so much! $338,000, or 50%, has come from active duty military. 1) The biggest donors to Obama in 2008, were the Banksters. 2) The biggest donors to Obama in 2012, are lobbyists…for the Banksters. 3) The biggest donors to Mitt Romney in 2012, by a huge majority, are the Banksters…and the lobbyists who represent them. 4) The biggest donors to Ron Paul in 2012, fully 50% in this sample of the top 20, are from the United States active duty military. You know, the military guys and gals, who are throwing their support behind the guy who is supposedly so “weak” on foreign policy. (Lobbying firm that has included many Big Pharma clients, as well as the Federal Reserve). Finally one of the many lobbying firms who are the top backers of Obama, willing to actually admit their clients. P.S. Have a meaningful Memorial Day…and remember the fallen, please. Data taken from OpenSecrets.org. Great website! Ron Paul has won Louisiana, Minnesota, Iowa, Nevada, Missouri, Washington and now we can add Maine to the list. Ron Paul needed to win delegate majorities in five states in order to be on the ballot come the GOP convention; now he has seven and his campaign is only gaining more momentum from here. The Huffington Post has the story and while it reports that Ron Paul has merely won the majority of delegates at 21 out of 24 remember that of the other three, one is the state chairman and the other two are national committee members. So, at this point in time Ron Paul has won all of the available delegates in Maine.
. . . and yet there’s been nothing but radio silence from the mainstream media on this phenomenon. Many disgruntled Americans have gone so far as to resort to conspiracy theories in an attempt to explain the MSM’s behavior – and considering the massive amount of existing evidence of the media’s blatant bias I cannot say that I blame them. To those who care about such things, the silence of the media about the extraordinary events around Ron Paul’s campaign is deafening. Some see conspiracy. I don’t. I see the expected reaction to a paradigm shift — a complete change in the concepts we use to make sense of our politics and culture. An excellent illustration of the power of a “paradigm” is the Perceptions of Incongruity experiment that was conducted at Harvard in 1949. What did the subjects see when shown those incongruous cards? They did not see the incongruous cards, but normal playing cards — the cards they were expecting to see, without noticing the incongruity. For example, when shown a black six of hearts, they might call out simply “six of hearts” or “six of spades” — neither of which was correct. The subjects didn’t misunderstand or misinterpret anything — they actually misperceived something according to the paradigm in which they were operating — in this case, “the playing card paradigm,” comprising everything they already knew (wrongly) about the cards they were looking at. Subjects continued to fail to notice the incongruous cards. Eventually, they would exhibit a physiological reaction of discomfort, knowing that something was wrong, but not being conscious of what. Only when they had been forced to look at many incongruous cards for very long times did they “get” what was going on and see what they were looking at. Suddenly, they realized that “the playing card paradigm” did not apply. They finally knew that reality included non-traditional cards. They thus adopted a new paradigm (that included black hearts etc. ), and thereafter saw what was in front of their eyes. Ron Paul wins the majority of delegates in both Iowa and Minnesota. 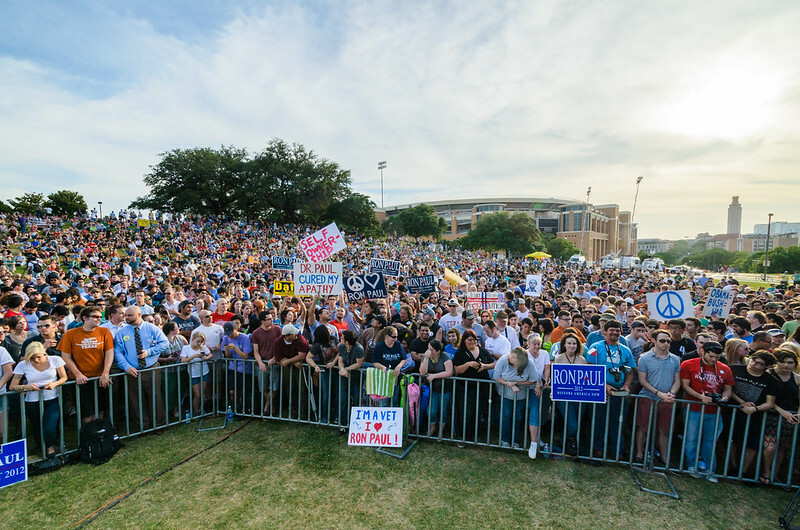 Thousands rally for every one of Ron Paul’s speeches in Texas. Ron Paul beats Romney in raising campaign funds in at least 10 states. Thousands of chanting, cheering supporters flooded the University of Texas campus to show Ron Paul some love Thursday night, undaunted by the prospect that the Texas congressman is a long shot for the GOP presidential nomination. “I’m convinced a revolution is going on. It is an intellectual revolution,” Paul said. Mitt Romney will most likely be the nominee but that doesn’t mean we should make it easy for him. Most Ron Paul supporters aren’t so short-sighted as to believe that this is merely about the primary. This is about a revolution and Paul’s supporters are in it for the long-haul.